The New York Times bestselling author of If Catfish Had Nine Lives returns to Broken Rope, Missouri, where ghosts of the Old West seek assistance from country cooks and amateur sleuths Betts Winston and her grandmother. We return to Broken Rope and we are not the only ones. A train station from the past pops up in an empty field and one of the passengers needs a little help. The kind of help only Betts and her grandmother, Miz can provide with a little assistance from Jake and our favorite ghost Jerome. My land, Paige Shelton has an amazing imagination! An imagination she can lasso up and herd together to create a truly entertaining mystery story or in this case the 5th fantastic mystery in the series. 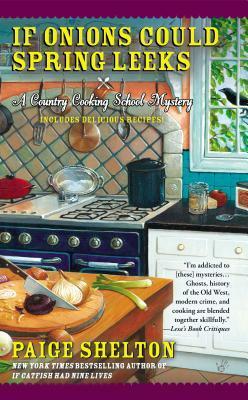 Betts Winston and her grandmother own and operate a Country Cooking School located next to a cemetery. Over the years they have realized they have a special gift of being able to communicate with ghosts. Ghosts like Jerome. He is my absolute favorite ghostly literary character. He also has a very special place in Betts’ heart. Something her current beau, Cliff, is just going to learn to deal with. Something is keeping Jerome from visiting Broken Rope right now but he knows Betts needs his help so he comes up with a very creative and sometimes very misunderstood way of making his presence known. Readers will find this quite amusing, the characters not so much. Shelton has a special way of blending mysteries from the past with mysteries in the present and they intertwine and flow seamlessly side by side. It is hard to call one a subplot because both so powerful and engaging. We can’t forget the Country Cooking School. This time they are featuring onions including the onion casserole standby of many homes around the country. That recipe isn’t in the book because it can be found everywhere but Betts and her brother Teddy had my mouth watering for Onion Rings and thankfully that recipe was in the book along with others I can’t wait to try. If you like your mysteries on the cozy side with a bit of a ghost story too these are the perfect books for you. They can be read as stand alone because the author always plenty of backstory for new readers but I sure recommend you read them all and in order because they are all just so darn so good. Paige Shelton has recently moved from Utah to Arizona. Find out more on her webpage here. You can also find her on Facebook. I really would love to win this one. Cozy mysteries are my favorite genre and this has been in my to-read queue for awhile now. I haven’t read any books by Paige Shelton, but If Onions Could Spring Leeks sounds like one I will enjoy. Thank you for the giveaway and review. This is a fun series, thank you for the chance to win the next one in it. I love this series, I have such fun reading it. Thanks for the chance to win. The book sounds amazing hope to read it. Wow love the books cover. Looks like another great cozy mystery. This sounds like a fun read! Thank you for the chance to win! I have not read this one but have read some of her other books and I’m a fan. One of my favourite authors, thanks so much for hosting this giveaway. I love reading her books and escaping with the characters. Sounds like a really interesting book. Thanks for the chance to win a copy! congrats & continued success to Paige!!! this is one of my favorite cozy series!! !